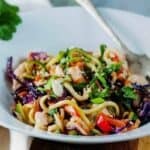 An Asian inspired lemon keto chicken dish that’s super easy to make and tastes better than take out. Pair it with broccoli for a great low carb meal! Today’s recipe comes from the Keto Essentials cookbook by Vanessa Spina. 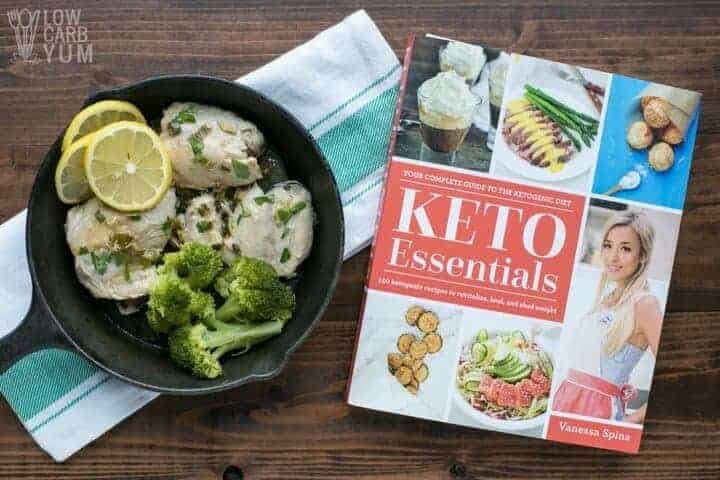 The book contains 150 ketogenic recipes along with some great information on the science behind the keto diet. There’s so many great low carb cookbooks coming out, it’s a bit overwhelming. 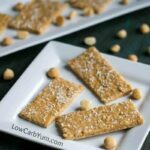 But, when I first started on a low carb diet over fifteen years ago, the first thing I did is stock up on recipes. Sure, you can find tons of keto recipes online, but it’s great to get off the computer and browse through a real book. 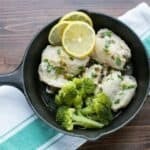 I was looking for a great keto chicken dish to try so I tested out Vanessa’s Lemon Chicken recipe. It was tough to choose a recipe to share from the book as there are so many mouthwatering photos. But, I thought I’d try something I could give to my husband to test. I figured if my husband eats the dish, it’s got to be an excellent recipe as he’s very hard to please when it comes to food. 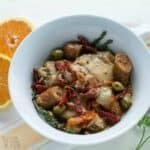 His favorite Chinese dish is General Tso’s Chicken so I thought this keto chicken dish would have a similar flavor combination. The recipe does call for boneless chicken thighs preferably with the skin still on. It’s impossible to get that unless you ask specifically from the butcher. And, I didn’t want the extra work of deboning chicken thighs myself. I do prefer chicken with the skin on as it provides that extra flavor and fries up crisp. So, I will need to try and find some organic chicken thighs with skin on it. My local grocery store didn’t have any. 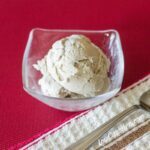 One of the things I love about Keto Essentials is that there’s an allergy guide on every recipe. This tells you right off it it’s dairy-free, egg-free, and or nut-free. I’ve been avoiding eggs and dairy and have cut back on nuts. 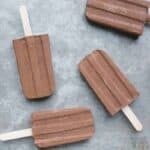 Having each recipe marked for these common food sensitivities is very helpful. 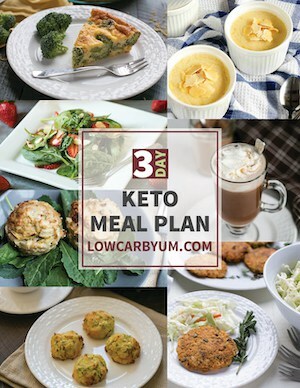 The book also contains weekly keto meal plans depending on your goals to help get you started. 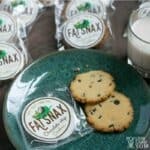 And, there’s a nice 2 sided page listing compliant foods with the serving size, total carbs, and fiber data included. You’ll also get the nutritional and macro data for each recipe. 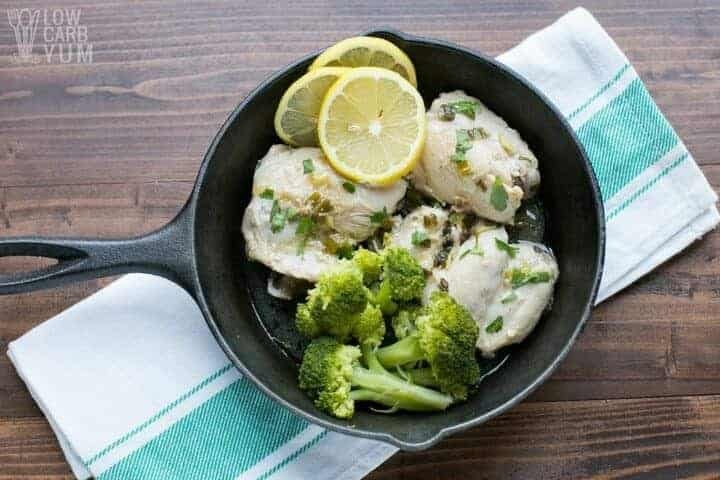 This lemon keto chicken dish with stevia comes out to 71% fat, 25% protein and 4% carbs. I can tell you that the recipe is a winner too because my husband at an oversized portion without complaints. He’s the pickiest eater in the whole family so you know it’s got to be amazing if he devours it. 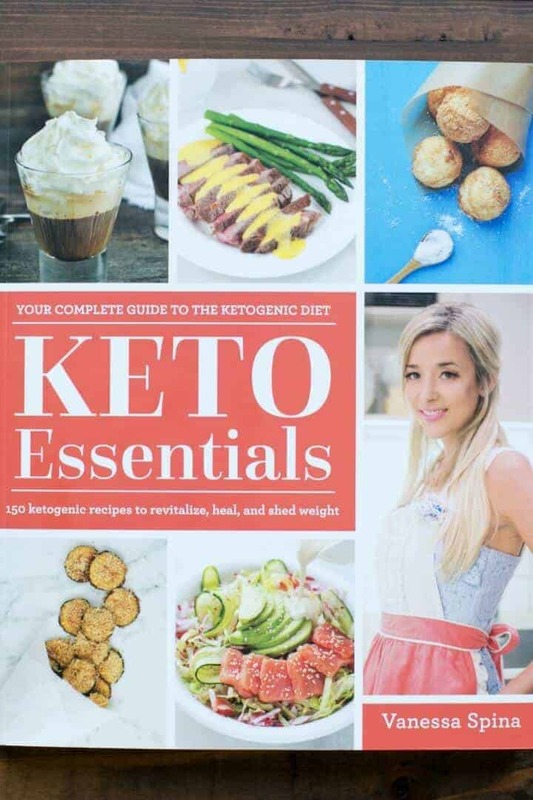 Keto Essentials is sure to become a best loved book in your low carb cookbook collection. 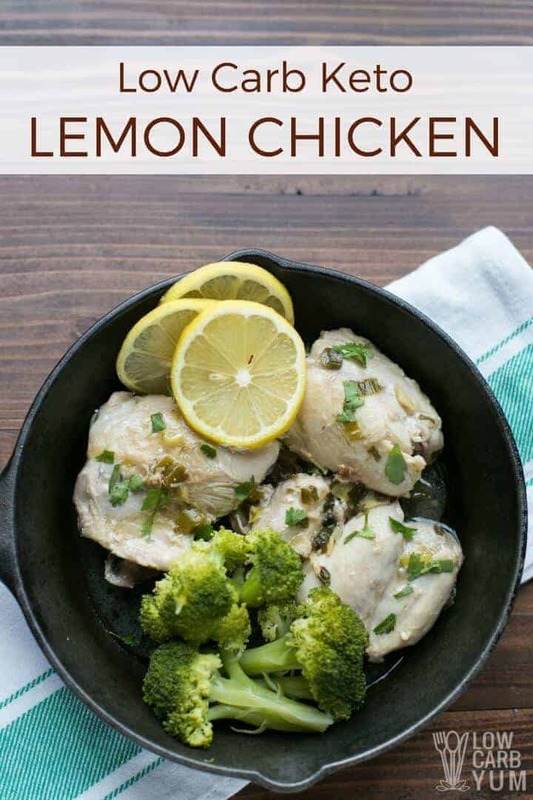 I loved the lemon chicken and can’t wait to try one of the dessert recipes. The Easy Vanilla Cupcakes look awesome! 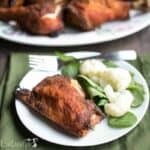 Since the keto chicken went over so well with my husband, I’m going to give the Teriyaki Chicken recipe a try too. My husband loves teriyaki so he’s sure to love it. He’s also a fan of my chicken adobo recipe. I’m also bookmarked the Dark Chocolate and Coconut Energy Bars recipe. In fact, I have all the ingredients on hand so I may test out that recipe this week. 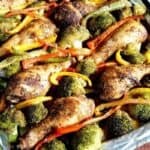 With 150 recipes in all, you are sure to find tons of recipes that you and your family will enjoy. It’s a beautiful book that is sure to become a best seller so pick up a copy today! 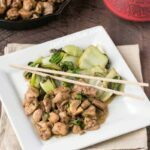 An Asian inspired lemon chicken dish that's super easy to make and tastes better than take out. 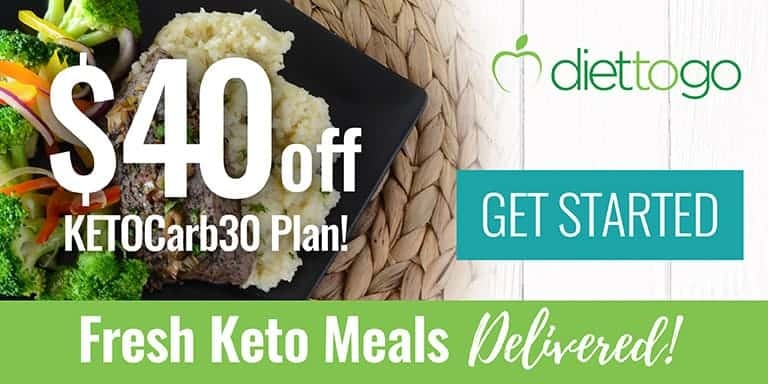 Pair it with broccoli for a great low carb meal! Start the sauce by combining guar gum and water. Let rest for 10-15 minutes until thickened. Heat coconut oil in large skillet over medium heat. Add the garlic, ginger, and onions. Fry for 2-3 minutes until fragrant. 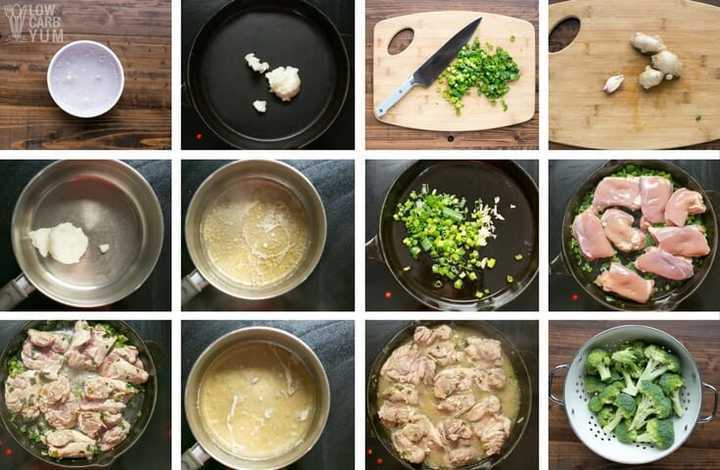 Add chicken to the skillet and increase the heat to medium-high. Fry for 5-6 minutes per side until golden brown on both sides and cooked through the center. Complete the sauce: Melt butter-flavored coconut oil over low heat in saucepan. Add the lemon juice, erythritol (if using), stevia, tamari, and salt. Stir in the guar gum mixture. Increase heat to high and bring the sauce to a boil, then reduce the heat to low and simmer the sauce until thickened (about 10-15 minutes). Bring a saucepan of water to a boil. Add the broccoli florets and turn off the heat, leaving pan on the burner. Let the broccoli sit in the hot water for 2-3 minutes, until lightly cooked and still dark green. Drain. Add the lemon sauce to the chicken in the skillet and mix until the chicken pieces are well coated. Sprinkle the cilantro and cashews, if using, over the chicken and serve with the broccoli. 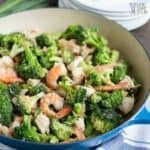 For an Asian twist, place each serving of chicken and broccoli over 1/2 cup (2 ounces/55g) of cauliflower rice or 1/2 cup (4 ounces/115g) shirataki noodles or shirataki rice.